These risks are real, but if you quit using tobacco now you can minimize your risk of oral health today. On March 6, 2019, Dr. Graver lost his 85 year-old father, Harry Bennett Graver, Jr. He loved and admired the changes for good that his father made during his lifetime. In the 1950’s, Harry quit smoking on a bet from a friend that he couldn’t quit smoking for over a year. He did accept that bet and went on to quit and then returned to his friend to collect the $100 wager. What would motivate you to quit? The only way to help eliminate these risks is to never start using tobacco products, or to quit if you do. In fact, simply reducing tobacco use is proven to help lower your risks. 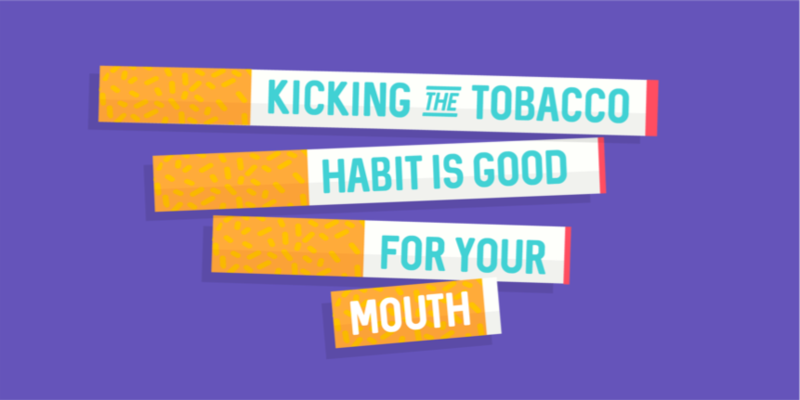 If you feel that it is time to reduce your risk of cancer, gum disease, infection and other oral complications, your dentist or doctor can help you create a plan to help you quit using tobacco, along with prescribing certain medicines or programs to help you kick the habit. Here at Beautiful Smiles Family Dental Center, programs we’ve shared with patients have helped make a difference in their lives, while helping protect their health at the same time. Remember, it is never too late to quit. In memory of his father, Dr. Graver will give a gift of $200 value to any patient who enters the practice as a tobacco user and then quits their documented tobacco use for over a year; $100 to reward the patient’s efforts and $100 in memory of Harry Graver and his motivational friend. Contact our office to get started! At Beautiful Smiles Family Dental Center in Etters, Pennsylvania, Dr. Graver offers a variety of techniques to keep your smile beautiful! We are always concerned about your comfort. Please call us if you have any questions about how our services may benefit you or someone you know.